Human cells have always been important in Maurice Wilkins Centre research, but new developments open up new ground for both research and therapy. The human body has over 400 different types of cells, all with different forms and function. For example, while some human cells stay in one place and join up to make sheets of tissue like skin, others can move about independently, like the white blood cells that spend their lifetime roaming around the body looking for enemies. Small wonder then that scientists are fascinated by different cells - and that Maurice Wilkins Centre investigators devote much of their time in the lab to studying particular cell types. An exciting recent development in the Maurice Wilkins Centre is the establishment of New Zealand's first "induced Pluripotent Stem Cells" (iPSCs). iPSCs are adult cells that have been reprogrammed to become embryonic-like stem cells that are capable of generating any cell type within the body. The reprogramming technology was discovered about 10 years ago and although it has since been refined, it remains technically challenging. Professor Alan Davidson and Dr Teresa Holm at the University of Auckland had grown iPSCs in the USA, before returning to New Zealand, and with support from the Maurice Wilkins Centre have now established the first iPSC lines from New Zealanders' cells. These cells will be used initially in diabetes research, in collaboration with Maurice Wilkins Centre Deputy Director Professor Peter Shepherd. Alan says, "Peter wants to study how a particular mutation associated with diabetes affects the production of insulin. 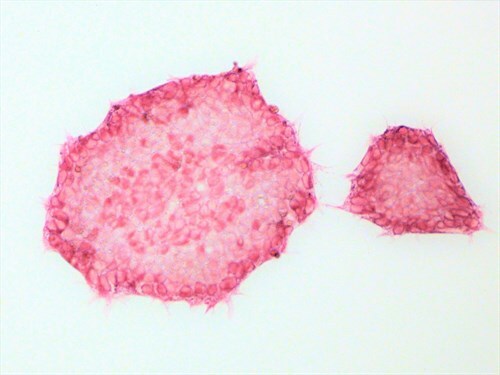 We can use the latest gene editing techniques to introduce the mutation into the iPSC lines, then coax the iPSCs to mature into pancreatic cells that make insulin. The mutated cells can then be compared with unmutated cells to see exactly how the mutation affects insulin secretion." Many other projects are already aiming to use the power of iPSCs and gene editing technology, so Alan and Teresa's platform will help launch many new ships. Two iPSC colonies stained red for alkaline phosphatase enzyme activity. Photo by Aneta Przepiorski. Other human cell types are being used directly in therapy, especially immune cells to treat cancer. The Malaghan Institute of Medical Research recently announced an agreement to conduct clinical trials of a new immune cell therapy for leukaemia patients, called "CAR-T" therapy. This particular form of CAR-T treatment was developed by scientists who are part of the Maurice Wilkins Centre's collaborative network in China, and the clinical trial will represent a new milestone in the Centre's engagement with leading Chinese researchers. A new cell therapy facility is also being established at the University of Auckland to support clinical trials of both immune cell therapy and engineered human tissue, such as the full-thickness skin product spun out into new company Upside Biotechnologies. Cell therapy and tissue engineering are therefore now firmly established within the Maurice Wilkins Centre's research portfolio, with the capability to take research from the bench to the clinical, mirroring that available to the Centre's drug and vaccine researchers. As new lab-based cell technologies are brought into the clinical arena to prepare cells and tissues for human therapy, the Maurice Wilkins Centre will be well equipped to translate its knowledge of human cells into practical advances in medicine.